Ok I tried not to complain/whine as much, but I can't stand the constant laming on the insta servers anymore. Use the forum chat or IRC if you can find a moderator connected. Even if you don't see the mod often on the IG servers, he might be useful. PS: I've been moderating the IGUK recently thanks to these messages from an undisclosed player. I stick to the USA server, the uk server has always been an unplayable lag-fest even with newnet and 40 ping. I have only really used !admin, if someone is cheating like gaga. Last edited by UT-Sniper-SJA94; 04-08-2013 at 05:36 PM. Played some games with Desteny today again, and all he did for most of the games was sit out mid dming or being a retard assing base to base. Other players are getting bored of his retarded playing style as well. It's not like hes hard to get past but it's so boring turning around and always seeing him there, running after you holding fire down, or sat out mid all game laming. Hi there. Thanks for posting this, I have banned him on both insta servers for a week. 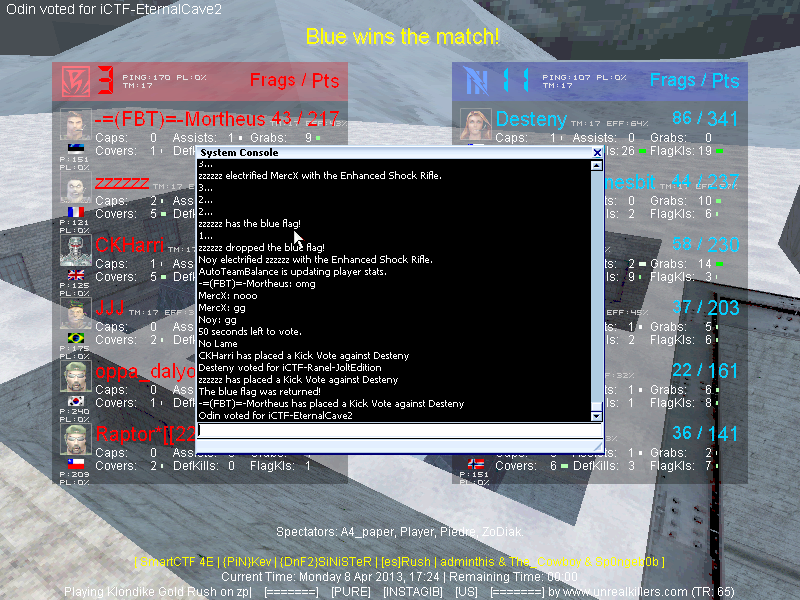 If you need assistance, you can find me on irc in #bt-match (quakenet) or #iPug(globalgamers). I can help out if present. Reason: "Defending" dming/assing out mid of control again.